Salmonella typhimurium uses the SPI-1 type III secretion system to invade host cells. Our lab uses an integrated experimental and bioinformatic approach to investigate the structure of this macromolecular assembly. 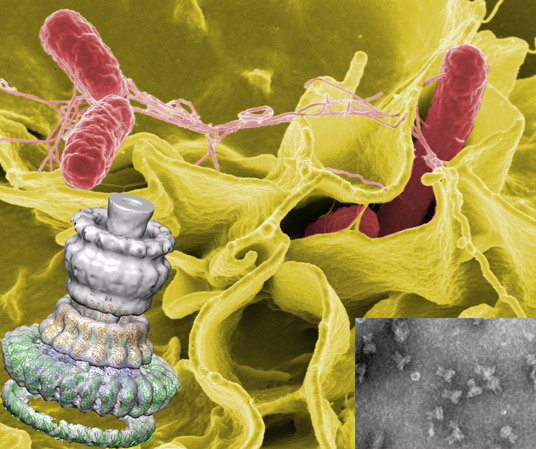 The background image shows a color-enhanced scanning electron micrograph of S. typhimurium (red) invading cultured human cells. Welcome new graduate students Sean, Andrew and Franco to the lab. Congratulations to Dustin for his contribution to paper in Nature identifying an inhibitor of NDM-1. Welcome new postdocs Christian Lizak and Natalie Zeytuni.